So today I was reminded of the fact that I have never been a bridesmaid. And it honestly makes me so incredibly sad and depressed. 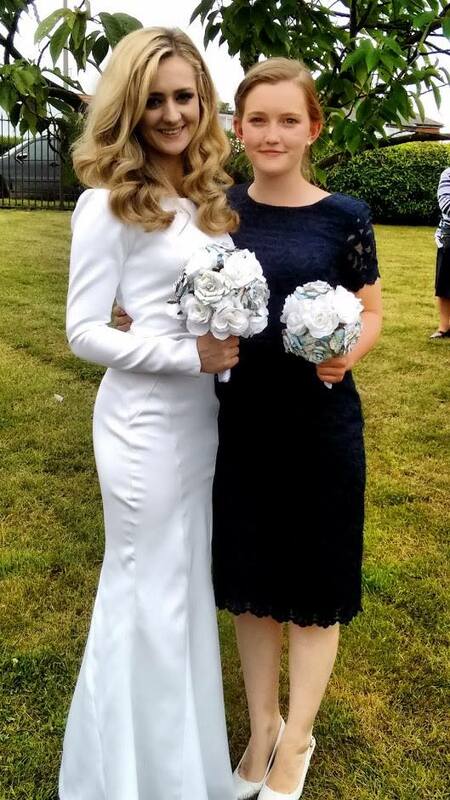 My beautiful friend was recently a bridesmaid and looked gorgeous. She has a blog post all about it if you want to check it out: https://alittlehistorygirl.wordpress.com/. How nice is this photo! Hope you don't mind I stole your photo! 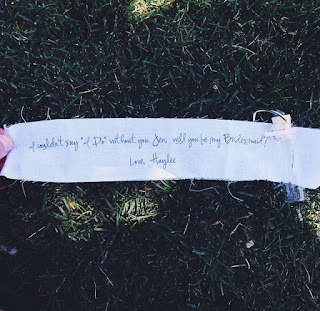 Another friend got asked to be a bridesmaid today and I think it is one of the cutest things ever! Congratulation Haylee and Tyler and Jen I hope you have the best time ever. But it makes me think back to last September when it was my oldest sisters wedding. The year before she got engaged she told me and Jess that we would be 'The first to know because [we] would need to organise dates to try on bridesmaids dresses'. I was so incredibly excited. When I found out she was engaged I kept waiting and waiting for the call or even a text. But not one. I asked dad if she had mentioned it and he said no. So still I waited. By June, we asked who the bridesmaids were and she told us. I was so disappointed and upset. Honestly, I was shocked. I had just taken it as a given. On the day there were a maid of honour, 2 bridesmaids and 3 flower girls. Dad cheered me and Jess up by saying we could at least go to the hen party. Okay...at least I would be apart of the wedding in some way right? No... I found out on Facebook that it had already happened. That I wasn't included, told or even invited. Honestly, by this point, the only part I was looking forward was spending time with Bop. First of all, I wasn't allowed into the venue but dad and all the bridesmaids were. In the ceremony, I wasn't even in the front; I was 4 rows back. When the bride is suppose to throw the bouquet that didn't even happen. I learnt that instead, she had asked a 4th person to be her bridesmaid and because she was pregnant she didn't want to 'ruin it'. So because Vicky felt like she wanted to make her part of it, she gave the bouquet to her. That makes me not even in the top 5 most important people. The professional photographer didn't take a single photo of me (apart from the official group ones of the family). I asked Vicky to take a nice photo with me and it never happened. The seating arrangement meant that our table wasn't even in the same room as the bridal party. It just felt very separated. Finally on the Sunday, we were all suppose to go on a picnic to the beach but we were the only ones who didn't...who knows why?! Anyway, Victoria had a blast but when I look back on the day, there is very little I want to remember. I shed a lot of tears and I told myself they were happy but maybe some were sad tears... I'm not sure I will ever be able to forget this moment of hurt. I've been hurt in arguments but honestly, I don't remember all the stupid petty things. This decision, coming from someone whom I love so dearly has left be heartbroken. Forgiven but never forgotten. I'm not sure I want to look back at how badly they read!